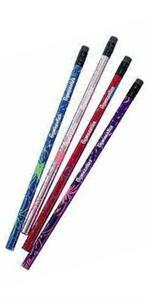 GYMNASTICS PENCILS! 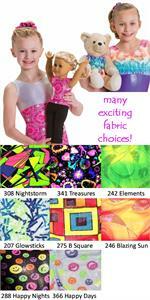 (design may vary from picture) Quantity Discounts Given! 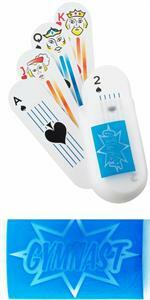 52 card deck oval elongated playing cards in GYMNAST plastic holder. 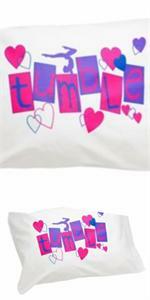 Glow in the dark Gymnastics tumble hearts standard size pillow case. 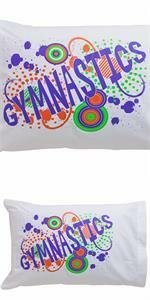 Glow in the dark Gymnastics neon circle swirls standard size pillow case. 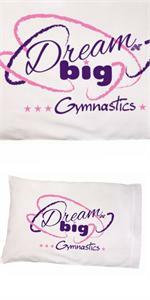 Dream Big Gymnastics standard size pillow case. 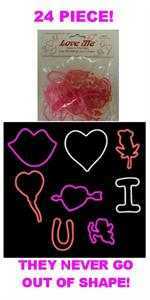 Last ones! 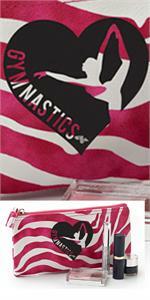 W1448 Zebra gymnastics stylish satin-lined makeup case made from soft material with leather grain. 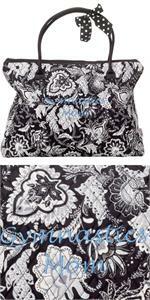 8" W x 4.5" H.
W1398 Zebra gymnastics sling bag - 13" x 17" bag with front outside zipper pockets, sturdy drawstrings, and reinforced corner rivets. 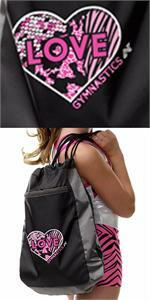 Large pink, silver and black Love Gymnastics drawstring sling bag features front zip pocket and drawstring. 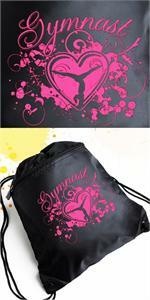 W1214 Black and pink heart gymnast string sling bag. 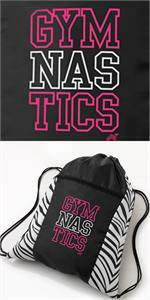 15" W x 18" H with outside front zipper pocket, reinforced corners, and drawstrings. 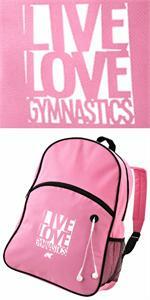 Large Live Love Gymnastics pink backpack includes mesh water bottle pockets,front zipper pocket with iPod port. Retired style - last ones! 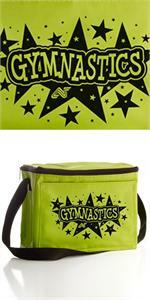 C4-W5006 Gymnastics Stars nylon lunch cooler. 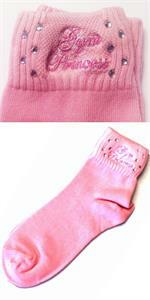 W5054 Pink zip top travel bag, removable zippered amenity pouch, inner zip side pocket, and 3 sleeves. 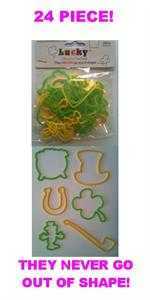 Double snap closure keeps items secure. 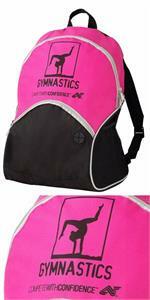 Large Compete With Confidence Gymnastics backpack with two mesh side pockets, an iPod port and a front zipper pocket. 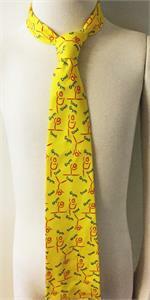 Retired style - last ones! 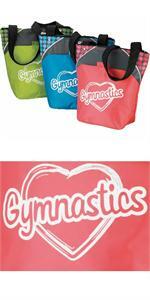 Insulated nylon Gymnastics lunch cooler bag with zippered main compartment and front slip pocket. 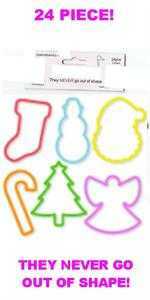 Last ones! 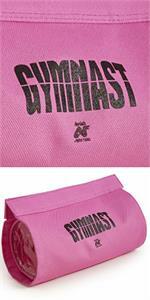 D11-GB 6.5" X 7.375" X 3" gymnastics gift bag. Confidence theme. D11-GNE Set of 8 4.25" X 5.75" gymnastics confidence theme (blank inside) notecards with white envelopes. CNF2-GNE Set of 8 3.75" X 4" gymnastics confidence theme (blank inside) enclosure gift cards with white envelopes. 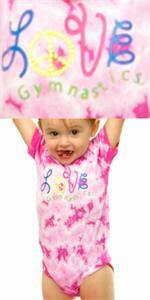 W387 Adorable I Love Gymnastics tye dye onesie for your baby!